It’s a New Year and my Facebook and Instagram newsfeeds are clogged up with words and images showing people tackling their New Year’s resolutions. Were you one of them? Have you resolved to lose weight, quit smoking, sleep more, or just generally be happier and healthier? If so, you’re not alone. The majority of people use the end of one year and the beginning of the next as a catalyst for change. The trouble is, there is an equally high number of people who fail to meet the goals that they’ve set for themselves. So, if you’ve decided that this is the year you make changes that result in a better you, where do you start, and how do you set yourself up to succeed? Before you start organizing your house, cooking healthier meals, or figuring out how to carve out another hour in your day to exercise why don’t you try showing yourself a little love and compassion? If you have a spouse, partner, child, sibling, or parent I want you to think about how you feel when you say, “I love you”. My son is only 3, but I’ve been telling him that I love him since long before he could speak. He now tells me that he loves me, and though I’m not entirely sure that he comprehends what love really is (how do you explain something so intangible to a preschooler?) he knows it’s a good thing. When you tell someone you love them something swells up inside of you and you feel good. The energy and emotion that come from the word and the sentiment are so powerful and positive that even a small child can understand how good it is. Why not take all the emotion and positive energy that you feel when expressing your love for others and direct some of that towards yourself? Loving yourself right now is the most positive change you could make. There is nothing wrong with goal setting at any time of the year, however, many people set goals for themselves that require too many changes in a short period of time and not being able to sustain all this makes them give up and feel like they’ve failed. This year, instead of trying to take on everything all at once, why not set up a series of smaller, more manageable changes and tackle them slowly over a longer period of time? It might take you a little longer to get to where you’re going, but you’ll stand a better chance of actually getting there. Over the next few days take stock of what you want to achieve and then break everything down into smaller bits. For instance, if your goal is to lose weight, think about the mini-goals that will help you accomplish that. Make your goal for this week something as simple as avoiding take out food – cook at home and bring leftovers for lunch. That, alone can be a big change for many people to make so stick with that for a week and then move on to something new. I’m going to spend this month offering you tips and advice on how you can harness the energy of New Years Resolutions and make simple, manageable changes that you can incorporate into your routine. Pick some that work for you and stick with them until you feel a comfortable habit has formed. No matter what your goals are, everybody needs a healthy snack. You could be a busy salesperson on the road, an executive running between meetings all day, or a mama on the run but the issue is the same – you need something portable, healthy, and easy to eat on the move. My answer? 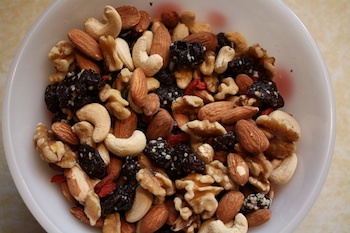 Trail mix! A lot of the stuff in stores is chock full of sugars (who the heck needs smarties in trail mix?!? ), or contains something that you may not really like. Think about your favourite things, make a list, shop, and take 5 minutes at home to toss it all together. You can store it in a jar and pack some up to take with you. Or just grab a small handful as a snack at home. There is no science to making this, honestly. Just chuck stuff into a bowl and toss it together well. Use a little less of the dried fruit since it is a source of concentrated sugars, but really, make it to your taste! After everything is well combined store in a glass jar in a cool, dry place. A handful makes a good serving size. Enjoy! So, what are you waiting for? Any day can be the day you start working towards healthier habits and a happier you! You don’t have to do it all at once, but if you don’t start somewhere you’re never going to get to where you want to be. If you keep putting it off, 365 days from now you will wish you had just taken the leap today.